Kalamazoo Industries S4S 4 x 36 inch abrasive belt sander was designed for general material removal whether you’re sanding, rounding an end and or just deburring. The Kalamazoo Industries S4S 4” x 36” industrial belt sander comes with the following: vertical/horizontal sanding head, 1/2HP 1PH 110V TEFC motor, spring belt tension, quick part replacement, quick belt tracking, and adjustable/removable work table. 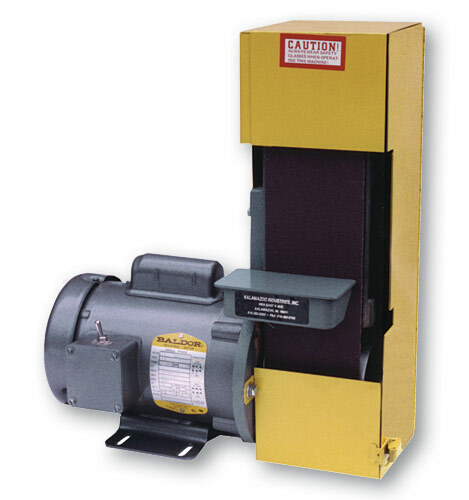 The Kalamazoo Industries S4S 4” x 36” industrial belt sander was designed to accommodate many different style 4” x 36” belts so you can achieve your desired finish. 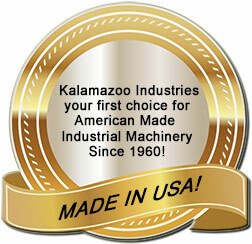 Kalamazoo Industries S4S 4 x 36 inch abrasive belt sander can be placed in a vertical or horizontal position. All that has to be done is take your allen wrench and take out the socket head cap screws out of the motor c-face rotate and replace socket head cap screws and tighten. S4S 4 x 36 industrial abrasive belt sander has applications in the following industries: Energy, Oil/Natural Gas, Petro/Chemical, Knife Manufacturing, Automotive, Metal Foundries, as well as many other Manufacturing and Fabrication environments. GREAT FOR SHARPENING AND DEBURRING! 1/2 HP , 1 phase 110 v 60 hz, Also available in 50 hz. (1 HP available, #S4S-1). Model:S4S-1 hp with a weight of 70 lbs.